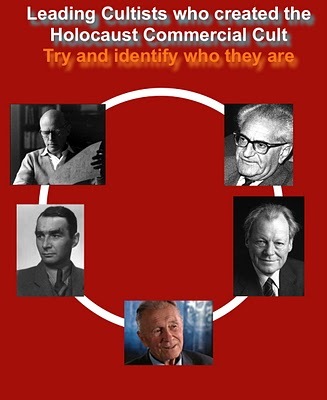 SOME OF THOSE MEN WHO STARTED THE CULT OF EXTERMINATIONISM, THE HOLOCAUST EXTORTION CULT. STEFAN SZENDE, THE TRULY ORIGINATOR IS NOT SHOWN IN THIS ILLUSTRATION. CAN YOU IDENTIFY THE FACES WITH EASE? GIVE IT A TRY! It all begun in popular fairytale lore by Stefan Szende who claimed that at Belzec in Poland, some five million, mostly Jews, were mass exterminated in some kind of swimming pool, electricity tank. They were never heard of again, nor those ‘witnesses’ he gives. The only one real here, evidently is Stefan Szende himself. Or, maybe he too is not for real? But from here: the story turns a dead end. Did Stefan Szende really write this? Or someone else using his name, or a team work of some of his friends shown here in our illustration? Stefan Szende himself told Ditlieb Felderer he never got one nickel from the Jewish Zionist publishing firm which published his? book, Albert Bonnier. EVEN WHOLE TRAINS TO HAVE GONE UP THE CHIMNEY! But Stefan Szende went even further than that. He even seems to suggest that all those thousands of trains going to the mysterious place in Belzec, were liquidated along with the people, for these trains never either came back, or returned from the arduous journey to secret Belzec, so secret in fact, not a trace of the alleged ‘mass extermination’ site exist. Not even the ashes of 5 million Jews! Not even the ashes of one Jew! As proof of the ‘mass extermination’ Ditlieb Felderer was offered a bunch of trees. Boring into the trees to determine their age via Dendrochronology, it was discovered these trees were put there at a time when the Germans long since had left. So, using Exterminationist logic, it was the Soviets who did the mass extermination, not the Germans. And here is how this yarn was spun on September 23, 1982, at the Merle Pollis talk show in Cleveland, Ohio, USA. There, and alleged ‘Survivor’ tells how people never came back. But neither did those trains. Evidently everything went up the chimney, a chimney that couldn’t work with ovens that couldn’t work. Monty Python story number one! Most of the people whom they took they didn’t come back. Next Next post: Kings come and Kings go. And so do their lies.